Quartz crystals from a recently discovered mine in Mexico. These crystals have been in the dark, slowly forming and developing and absorbing the power of the earth hidden from the view for millions, possibly even billions of years. The crystals are exhibiting a range of forms or habits. Here are some examples. Lemurian Quartz crystals have six sides and a fine point. They may be clear, colored or smoky, but are distinguished by the horizontal lines which have formed along their length. Those who really know about Lemurian Quartz emphazise it is important to be able to feel the lines when you run you finger down the length of the crystal as they may not be visible. Some people distinguish between Lemurian and "Lemurian Seed Crystals". The "seed" form is said to have alternating clear and frosted sides around the crystal. There is much folk lore surrounding these crystals. Some say they must come form a specific area in Mexico, others say Brazil, but in truth they have been found at locations all around the world. It is also said that the island of Lemaria once existed in the Pacific Ocean, and then sank beneath the waves in the same manner as beliefs about Atlantis. In the new and developing science of tectonic plates and activity, who is to say that these events did not happen millions of years ago. Whether Lemaria existed recently enough for it to be inhabited by humans is doubtful, but if it did, some believe that these peoples had a deeply spiritual and psychic tribal culture whose values included unconditional love. So it is said that the crystals hold the rich and powerful spiritual knowledge of the Lemurians. How and why are Lemurian Quartz crystals used today? For many, Lemurian Quartz is know as a master crystal that can give multi-level healing in the body, heart, mind, and spirit. It is said to balance polarities and help to recover from a stroke, assisting with cellular memory healing. Many believe it is an excellent companion crystal because it gives what is needed when you need it. Returning to the lines or striations along the side of the crystal, these are said by many to represent the stairway to heaven. 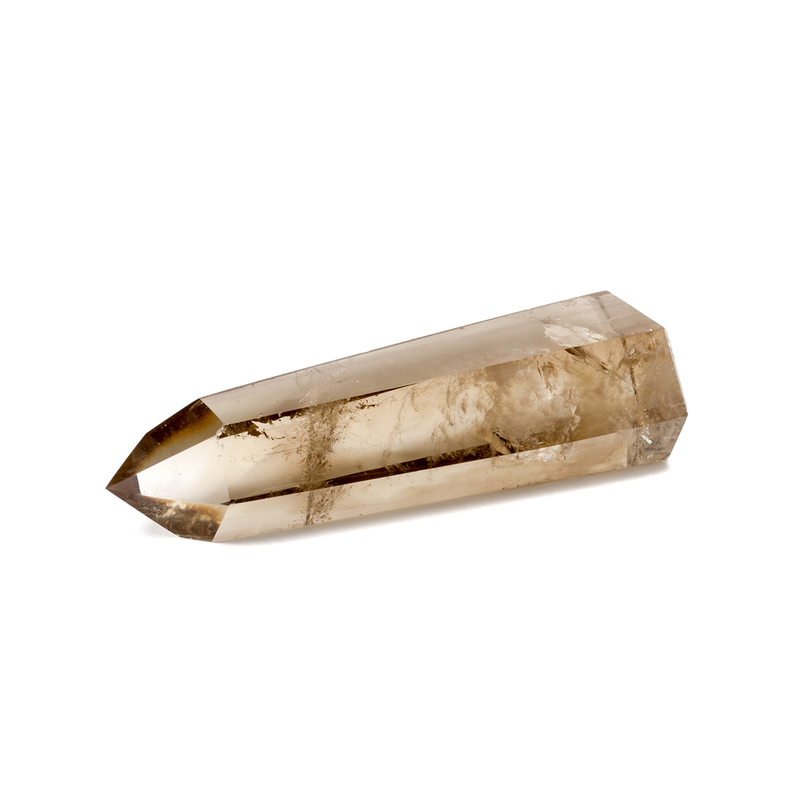 Quartz Points While the most common mineral on earth is Feldspar, Quartz is the second most common. It can be found in a wide variety for forms, or habits. Quartz is formed from Silica and Oxygen, known as Silicon Dioxide either alone or with various inclusions which result in "smoky" and "Citrine" from Aluminum molecules in the lattice; "Amethyst" from Iron inclusions. But it is the clear sparkling Quartz which always catches the eye. 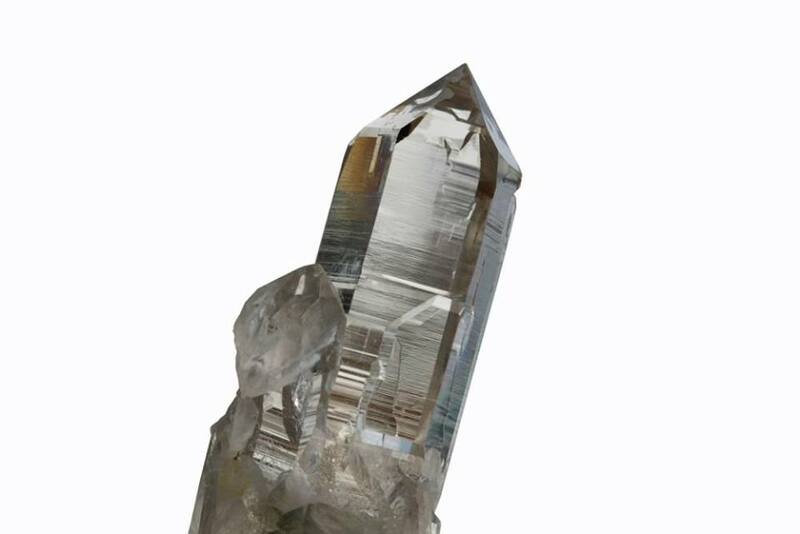 Quartz wands can have a single point, or a point at each end of the crystal which is then known as "double terminated". The example shown here has a single termination and is slightly smoky. Also known as a master crystal. The reason for this is they are believed to strengthen all the things that are positive, and hinder those that are negative and causing fear or anger. The crystals are said to enhance the ability of the individual to be a loving person, their abilities to enjoy life and accomplish the things they want in life. They can amplify intention, reduce stress, help with centering (balancing or calming), strengthen inner healing abilities, and surround you with protection by amplifying white light. And they can make it easier to take steps toward personal growth. When buying a quartz crystal always look for the quality of the point. This should be clear and undamaged. Where the crystal is six sided and all six sides lead to the point this is known as a "generator". These are said to both create energy and to amplify the energy in other crystals. Generators can be any kind of quartz, milky, smoky, rutilated or a beautiful clear colorless crystal.